This shortcut teaches you how to use Mongrel, the new high-performance web application container for Rails. It starts with basic setup and installation, but goes well beyond the basics, showing you how to set up Mongrel clusters, how to use Mongrel behind Apache and other web servers, and more. 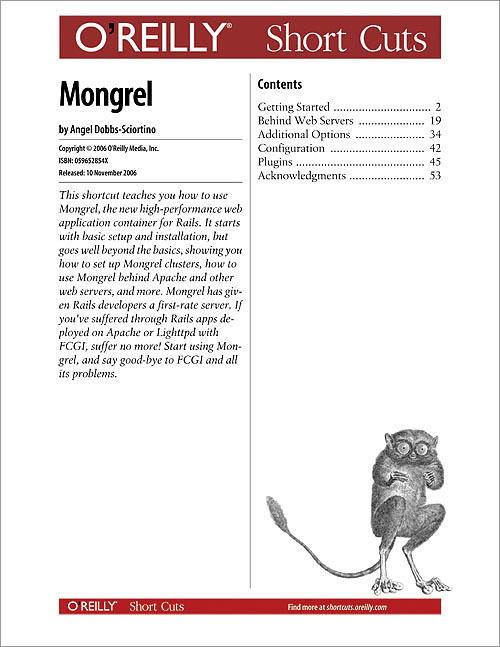 Mongrel has given Rails developers a first-rate server. If you've suffered through Rails apps deployed on Apache or Lighttpd with FCGI, suffer no more! Start using Mongrel, and say good-bye to FCGI and all its problems.